Making your event a huge success is what drives us – we will work with you throughout the whole process from the planning stage, right through to running the actual day itself and the post-event evaluation. Our dedicated events team is very hands on and ensure the smooth running of your function, whether it’s your wedding day, a business conference or a special birthday. Thank you for choosing Shampan at the Spinning Wheel. Should your plans change, please let us know. We look forward to serving you. Brandy, Kahlua, Baileys, Blue Curacao, Sambuca – served Flaming! My friends and family took me to Shampan for my birthday treat. The ambiance was pleasant and the tables spaced out with plenty of staff around so all looked promising. However, despite numerous staff, the service was absolutely dreadful! They gave us drinks in the lounge before the meal, but failed to ask us if we required more at the table (except water, at almost £5 a bottle!!). We had to ask at least three different members of staff long after our food had been served to order and then chase up the delivery of our drinks! One drink never came at all! We received no apologies for this. Three members of our party also then complained that their food was too spicy (having ordered mild dishes). At the end of the meal, we were then overcharged for an extra bottle of water and it didn't reflect the £80 deposit I'd made. It had automatically added 12.5 % service charge, though, plus an additional 'voluntary' charge for their charity!! Again, we received no apology for this. I would expect an establishment keen to achieve good quality customer service/satisfaction would do this at the very least, if not offer the party complimentary chocolates/liqueurs! Bitterly disappointing! Such an enjoyment! Made the right choice choosing Shampan to celebrate my fiancé’s birthday. Food is gorgeous, as well as the cocktails, could not ask for better service. Only downside was I expected to be able to use apple pay, however they only take card!! Had to go get cash from cash point in Biggin Hill, so make sure you take your bank card or cash to pay!! Thanks for a lovely night Shampan! We went to celebrate my husbands birthday and we all had a lovely experience. Very quiet as it was a lunchtime but service and food were outstanding! my friends and I had a lovely meal at Shampan for a celebration of a birthday. I could not fault anything at all. The food was superb and the service very good. we will be returning at some point for another occasion. Loved it here, my only criticism is that the good was a little too salty. The food was extremely tasty and freshly cooked. The restaurant was not busy at all. The restaurant staff were friendly and welcoming. I would definitely recommend this to anyone who loves authentic Indian cuisine. Live this place - had to wait a little while for the table but it was mother’s day so quite busy. Average food was simply to expensive. £110 for 2 adults and a child for buffet plus bottle of red. It was all worth half of the price and this is the price one would expect to pay for such service normally. Great staff and lovely food is a winning combination. The table was wonky. The same song repeated over and over. The waiter poured water into my wine. The toilets were trashed as there had been a large wedding party that day and obviously not cleaned up after that. The food was nice, but not exceptional and very overpriced with gratuity and a charitable donation added when the bill was presented. My family don’t like to make a fuss, so we just paid and left. We will not go back and would not recommend. Our favourite ‘posh’ Indian restaurant. Great cocktail bar, lovely people and excellent (eclectic) menu. Our twin girls (15) got dressed up (not just jeans!) and we all enjoyed some cocktails (mocktails) before the meal. Great place for a special occasion......will definitely return with friends/family. Food lacked flavour and hoovering waiters detracted from the experience. Drinks over priced based on the venue not being in central London. Great service and food as always. Gets a little noisy at times, but food and service out weighs this little annoyance. One of the best indian restaurant's around. Went there for my birthday started ok but then had to ask for water three times before my guest got the water was left waiting for long periods when we wanted to order another drink and dessert. Very tasty food. Had the Bhatti chicken absolutely lovely. The restaurant is lovely, the food is amazing but because it’s such a large area the noise level gets extremely loud, which is a bit over whelming. The seven of us did enjoy our meal last Saturday evening. None of us had been there before. The food was excellent. The service was excellent. The actual restaurant was stunning. However, the noise level was unbearable. None of us have a problem hearing under normal circumstances but because there were no curtains or carpets to absorb the noise we had great difficulty in holding a conversation. In the end we could only really chat to the person next to us. It was far too difficult to hear anything across the table which was such a shame when you were going out with friends you haven't seen for a while. Service perfect and food amazing! My Favourite restaurant by far, service, food and cocktails all amazing, cannot wait to go back. Great food. Great atmosphere. Great service. Very enjoyable evening. The staff were very friendly. Highly recommended. Unfortunately food was a letdown ... Kentish lamb shouldn’t be on the menu ! Great food. It was the first time we'd been and I'll definately return. I had prawn shashlick for my main, they were thr largest prawns I've ever seen. As usual a great evening with lovely service, comfortable and relaxing surroundings and fantastic food. 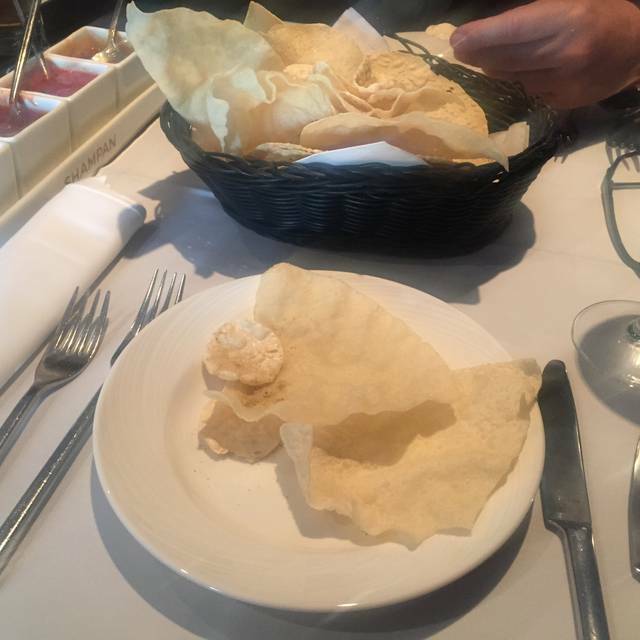 Nice venue, the restaurant is very well presented with plenty of room between tables, not the normal Indian restaurant atmosphere, quite luxurious feel to it. The staff on the whole were very good, we visited on a sunday, there was either a sunday buffet or a la carte menu available, most people opted for the buffet. We opted for the buffet too, there was good choice of starters, mains and side dishes, all were well cooked and very tasty. We had a lovely family meal here on Xmas eve, super cocktails in the sumptuous lounge before enjoying great meal and service from the friendly staff. A fantastic experience. Great unobtrusive yet very attentive service. The food is fantastic.Our group had some special dietary requirements but we all had a decent selection. The food at The Shampan was wonderful but of particular note was the level of service provided! A truly friendly and exceptional service that made an already special occasion that much better! The food was ok for a local Indian, however the flavours were too mild. The Dahl was so mild it was almost like a lentil soup. we mentioned this to the waiter and all he could say was sorry. we did not eat it and as a good will gesture they should not have charged us for it. The Shampan is a big restaurant but you don’t feel you’re in a barn, it’s spacious and the tables aren’t too close to each other. 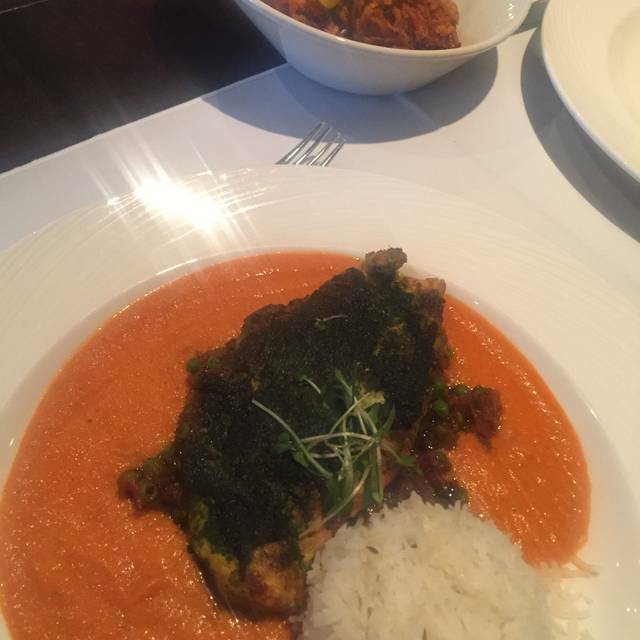 But it’s really all about the food, really clever, subtle spicing and top quality ingredients, a country mile away from the average high street curry house. The service is knowledgeable and friendly, oh and they do the best Bloody Mary I’ve ever tasted! Another great visit, many thanks! Great service and fantastic food!! Will be revisiting in the near future with additional numbers to the party.